Here in the Windy City, residents understand that moisture is commonplace. Humidity, which is a way of referring to the amount of water vapor in the air, can play a major role on the jobsite, especially when moisture-sensitive building materials are used. Drywall installation, for example, relies on humidity control measures to keep boards and panels free from excess humidity and saturation. It is important for builders everywhere to hire an experienced drywall company to help combat concerns such as temperature and humidity. When left unchecked, these environmental factors can cause serious problems throughout the construction process. If you’re looking for a trusted team of drywall contractors in the Chicago area, AZ Drywall Finishing is here and ready to lend a hand. For more than 20 years, our pros have worked to create comprehensive quality across numerous industries. Today, we’ll highlight a few problems to watch out for when the weather turns south and high humidity levels are present. If you’re ready to get started with our contractors, be sure to fill out our no-obligation estimate form. Mold growth — Warm, damp environments are ideal for mold growth, and humidity can make matters worse. It is essential to keep the building dry throughout construction and beyond for the best results. Drywall damages — Wetter conditions will increase the drying time for your drywall installation. Heavy humidity during construction can result in problems later on, as drying boards begin to dry out and shrink, resulting in cracks and compromised surfaces. Paint problems — Higher humidity will increase the paint’s drying time. Additionally, the damage to the drywall will also impact how smooth your surfaces are. Be aware that different types of paint will perform differently at each temperature level. We recommend following all product recommendations! Warping of wood — If you have wood structures as a part of your building’s construction, heavy moisture exposure can lead to additional problems. As a natural material, wood is susceptible to water and moisture damage, and will begin to warp and well once saturated. Rust and corrosion — Excess moisture in areas that were not designed for such intrusions can impact untreated metal surfaces. When enclosed, heavy humidity will increase oxidation and corrode the integrity of the metals. Poor indoor air quality — Damp conditions at the time of installation can lead to air problems later on. Wet, humid environments encourage bacterial growth, entering the HVAC system and putting inhabitants at risk. 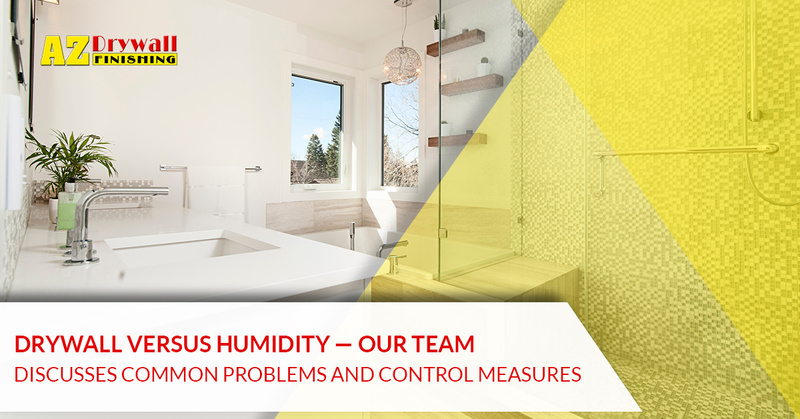 The link between water intrusion and humidity cannot be denied, making it essential for your drywall contractors to take extra steps to keep excess moisture out. Heavy moisture content in the air can condense and coat nearby surfaces. Over time, this saturation can result in more costly problems and health concerns. It is up to your hired drywall company to take active steps in order to minimize outside influences that can disrupt every aspect of construction. Deploying tools such as dehumidifiers can do much to restore favorable conditions to install drywall. These devices pull moisture out of the air and condense that water into a tank for removal. Heaters can also be deployed to create better conditions for hanging and finishing drywall. This material tends to do better in comfortable conditions between 60 and 70 degrees Fahreneheit, but can do well in settings as low as 45 degrees. Chi-Town is known for bitter winters and warm summers, making it essential for builders to take extra measures when working with sensitive building materials. Your drywall company will be required to maintain a stable environment throughout the installation process. AZ Drywall Finishing is here to provide ideal results for businesses across all industries, and can work with you every step of the way to abide by all local and federal building regulations. Contact us today to learn about our services, and be sure to ask for your free project quote!